Are you looking for a promotional tool that will take your business to the top? Many companies will randomly choose promotional products and put their brand on them, but it takes more than that to increase brand awareness. We offer transparent plastic cards customized with your brand name, message or your company logo. Although clear plastic cards are transparent, you can still have a company name and/or coloured image that represents your business printed on them. There are several marketing advantages to creating and giving away imprinted promo plastic business cards and loyalty card items, including increased response rates and an improvement in business returns. Clear plastic cards share a lot of the same qualities that regular printed cards have, with one difference. These plastic cards have a handy transparent section to create a more unique, yet elegant and professional look for your business. Companies and retail stores often like to use transparent cards because it signifies trustworthiness and transparency as a business. These are no ordinary business cards. They can be used as rewards cards, loyalty cards, ID cards, gift cards, VIP cards, and more. The custom options and available reward features of these cards will help your business stand out. These clear plastic ID cards are commonly used by a wide range of different businesses and companies. The various businesses that are known for using these types of cards include, but are not limited to; Restaurants, retail stores, clubs, hotels and motels, gyms, gas stations and convenience stores, clients or customers, schools, etc. Your staff will even get a certain sense of loyalty and appreciation from your company when you hand them one of these cards. All of our products are made with quality PVC plastic materials. We use colours that are vibrant and eye-catching. You can choose to have any graphics or text printed on the cards that will help represent your business in a professional way. You can customize these clear plastic ID cards to match your company colours or logo to perfection. We also have a new creative feature that has recently been added to our printed loyalty cards. Now you can have your order of cards cut into any dye cut shape, molding, or size that you’d like. For example, if your business sells sporting goods, you can have the cards cut into the shape of a baseball or football. Try combining these cards with an ID badge holder and custom branded lanyard to maximize your company impact and exposure. Not only can our clear plastic ID cards be customized with your company name, business name, phone number, graphic, logo, etc. You can even have a picture digitally printed on your cards, which will also add colour to them. 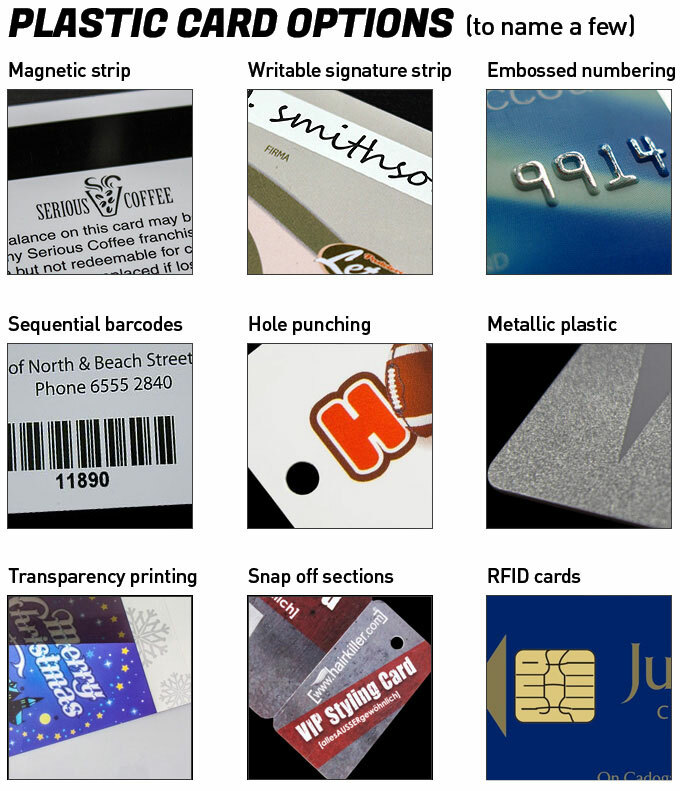 Some of the additional customizable options that we offer include a signature writing area, magnetic strips, sequential barcodes, punched out holes, smaller snap off cards, RFID cards, and transparent printing. We can also provide sequential numbering and magnetic chip fitments. Our clear plastic business cards are guaranteed to give you a promo boost. Whenever one of these cards are used, your company name and logo will be visible to the public. The colours, graphics and imaging that we use is vibrant and eye-catching. If you’re using these cards for customer rewards or membership cards, they will draw attention to your business. Someone that is familiar with your business may be unaware that you offer customer advantage cards. People that are unfamiliar with your business will be prompted to ask about it when they notice someone with your card. Consumers are always more likely to do business with a company that rewards loyal customers. So simply offering a reward, advantage, or membership card will boost interest. When you purchase your clear plastic ID cards from us you are getting the lowest possible prices. If you find these cards from another Canadian supplier at a cheaper price, we will beat it. We want to make sure our customers are getting high quality products, at cost effective prices. You will never get something delivered to your door that you weren’t expecting. If you’re having a hard time figuring out what features and colour scheme will best suit your business, you can contact us and we’ll be happy to help you create a card that compliments your company. If you already have an idea of what you would like your cards to look like, apply for an online quote. We want to make your experience with us is as simple and pleasant as possible. Order transparent plastic cards from Dynamic Gift Promotions Canada and see your business grow.